The rocks along Arda river valley are coulee from active volcanic activity millions years ago. Some of the craters were partially destroyed by the river waters. Nearby Studen kladenec village and close to the dam wall were formed big veins of quartz and chalcedone inclusions. This is the highest peak in the Karakulas elevation – 1459m. The path leading to the peak passes through very beautiful scenery with alternating forests and bare hills. The high cliffs and monuments from Thracian times are typical for the region. The view during the peak’s climbing is astounding – the presence of both dams (Kardjali and Borovica) and Arda river certainly leave unforgettable impression. A deep narrow canyon-like defile exists on Arda river near by the dam wall. It is around 1km long and is called Sheitan (Devil) by local people. In the narrowest places the rocks are almost vertical with height from 5m to 10m. The river is from 1m to 6m wide and with depth up to 20m. Before the dam wall was built a constant scary rumble was heard from the place. Nowadays the gorge has less water, but still impresses with its sizes. The landscape is very picturesque. Above the field with Turkish hazel (“Dzhelovo” nature monument) is situated the plateau-like peak Dzheleve. It is 772m high and reveals a view to Iran tepe peak. Traces of a necropolis could be seen on its slope and nearby is located a well that never dries out even in the hottest days. There are remnants of a fortress wall as well. Until recently all believers from the area have gathered for a rain prayer (yamur duvasa). There was also a turbe on the peak, where local Alians lighted candles. Nowadays that tradition is no longer practiced. 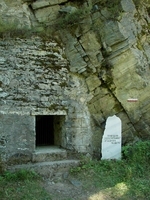 The cave is located in the area of the hunting house of “Gaidarci” game station in Rusalsko region. Its entrance is close to the right bank of Malka Arda river (Davidkovska river) before it flows into Arda river. Nearby the cave passes the road to Lubino village. It is an arch-like one-gallery cave with length of 5-6m. It has high humidity levels all year. Despite the season the temperature in the cave remains constant at 3-4ºC due to the tiny cracks and the nearby presence of water.